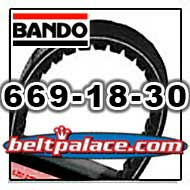 BANDO 669-18-30 Scooter Belt - SYMMETRIC BANDO Hi-Performance 669 VS belt for Scooters. Replaces OEM Qinjiang VS belt 669. Home > CLEARANCE > BANDO VS BELT 762x21x30. OEM YAMAHA 5NW-E7641-00-00 belt. > KEVLAR 828-22-30 Scooter CVT Belt. Spec: 828x22.5x30. OEM High Mileage CVT Belt for 23100-KM1-671. > BANDO 669-18-30 Scooter Belt, SYMMETRIC 669 VS BELT. 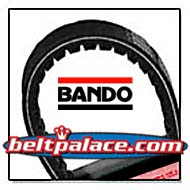 BANDO 669-18-30 SYMMETRIC Scooter Belt, BANDO Hi-Performance 669x18x30 VS belt for several Chinese made scooters. Replaces Inferior Qinjiang VS belt 669. V-Belt CVT Drive Belt 669 18 30 fits GY6 50cc Scooters. Kevlar CVT Drive Belt size 669-18.2-30 OEM belt on 50cc 4-stroke QMB139 Street Scooters with 10" rear wheel. KEVLAR 669 18 30 CVT DRIVE BELT GY6 49CC 50CC 139QMB SHORT CASE 4 STROKE SCOOTERS - SYMMETRIC - These 669 belts are V-shaped, NOT flat on one side! *** To replace Flat-Sided (ASYMMETRIC) Qinjiang 669 Go-Kart/ATV belts click here!